The last round of the ICVS was coordinated by UNICRI (Van Dijk, Van Kesteren & Smit, 2008). In developed countries the ICVS consisted of computer-assisted telephone interviews of probability samples of 2.000 inhabitants per country. The questionnaire includes questions about victimization experiences in the course of last year covering various forms of frequently occurring types of crime (e.g. burglary, robbery and assaults). The ICVS asked about consumer fraud for the first time in the 1992 sweep in developed countries. People were asked whether someone selling them something or delivering a service had cheated them in terms of quantity or quality of the goods or services during the past year. Although the question does not exclude serious incidents of fraud, most of the incidents reported probably amount to simple forms of cheating in shops. In the fifth sweep of the ICVS, carried out among samples from 30 countries and 33 capitals or main cities, those who reported being victims of fraud were asked whether this happened while shopping on the Internet. Answers to the latter question are the source of the results presented here. On average, 11% of respondents in the participating countries said they had experienced some type of consumer fraud in the course of last year (2005). Victims of consumer fraud were asked where the incident had taken place. At a national level, 45% of victims said the fraud had taken place in a shop; 11% was the victim of a fraud during either building or construction work or by a garage, while 9% mentioned it had happened while shopping online. This implies that 1% of the national inhabitants of developed countries had been victimized by a case of E-fraud in the course of one year. Among inhabitants of capital cities, the victimization rate by E-fraud was 1,5% in one year. Table 1 illustrates these details. Victimization by Internet-based consumer fraud is most common in the USA, Poland, Germany, Bulgaria and the United Kingdom. Prevalence rates are lowest in Italy, Finland and Greece. Among the capitals Lima (Peru), Berlin, New York and London stand out with comparatively high rates of victimization. In a second follow-up question, respondents reporting fraud were asked whether it had been a case of credit card fraud. It was so in 7% of all cases of fraud and in 27% of all cases of E-fraud. The latter finding shows that a major part of E- fraud consists of Identity Theft with the use of credit cards (Identity Fraud. )(1) Furthermore, the ICVS results showed that only 10% of all frauds are ever reported to the police. Cases of E-fraud are presumably more often reported to other agencies such as banks. According to UNDP’s 2006 Human Development Report, between 50 and 70% of the population in industrialised countries had access to the Internet in 2005. This implies that around 2% of Internet users had been victim of Internet-based fraud annually. 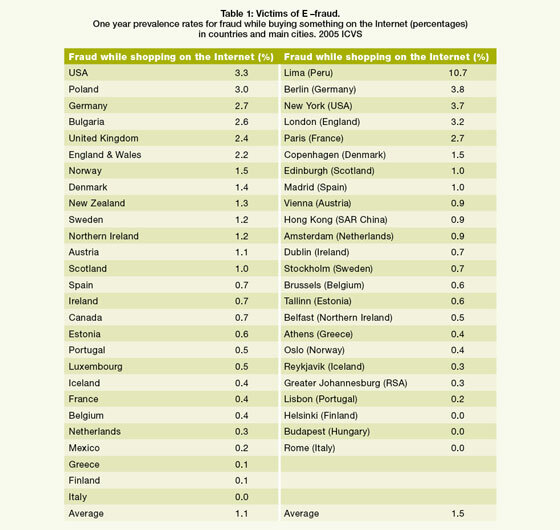 In many developed countries in 2005 Internet-based frauds had reached prevalence levels similar or above those of conventional property crimes such as car theft or pick pocketing. Prevalence rates were, as mentioned, especially pronounced among inhabitants of main cities. Since 2005, both Internet access and E-commerce (the use of Internet for shopping) have become more common. It is therefore likely that prevalence rates of Internet-based frauds have gone up significantly as well. In fact E-fraud might well be on its way to becoming the most common form of property crime affecting citizens of the industrialised world. Discussion: Is E- fraud Security Driven? Countries or cities with comparatively high rates of victimization by Internet-based frauds are a mixed group in terms of Internet use. It comprises both countries where Internet is most widely used (the USA and the UK) and countries that are technologically less advanced (Bulgaria and Peru). Locations with low victimization rates also appear to be heterogeneous in terms of Internet use. For example, the use of Internet for commercial transactions is very common in Iceland and Finland where Internet-based fraud is rare. On the face of it, there is no strong relationship between the prevalence of E-commerce in national populations and the prevalence of E-fraud. According to criminal opportunity theory E-crimes are likely to be driven by the extent of E-commerce. The lack of an obvious positive correlation is therefore somewhat surprising. One possible explanation for the lack of such relationship is an inter-country variation in the legal and technical security measures against E-fraud. Examples are differences in the authentication procedures for the use of credit cards or for online banking. In some countries the use of pin codes has been made obligatory for the use of credit cards, while in others it is not. In the USA, authentication for online banking has remained relatively simple (use of a single password), compared to, for example, the Netherlands where the Central Bank has imposed more stringent security procedures on banks (Vermeulen, 2010). The variation in security provisions might determine prevalence of E-fraud more strongly than differences in the level of E-commerce per se. This “security hypothesis” merits further testing in comparative international studies such as the 2010 round of the ICVS. Dijk, J.J.M van, J. van Kesteren & P. Smit (2007), Criminal Victimisation in an International Perspective; key findings from the 2004-2005 ICVS and EU ICS, The Hague: Ministry of Justice/WODC (www. WODC.nl/publicaties). Johnson, H. & T. Krone (2007), Internet purchasing: perceptions and experiences of Australian households, Trends and issues in crime and criminal justice, no.330, Canberra: Australian Institute of Criminology. Walker, A. et al. (2009), Crime in England and Wales 2008/2009, Vol 1 Findings from the British Crime Survey and police recorded crime, Home Office, July 2009. * Prof. Dr. Jan Van Dijk was the director of the Research and Documentation Centre of the Dutch Ministry of Justice and professor of Criminology at the University of Leiden. In 1987 he launched the International Crime Victims Surveys. Between 1998 and 2005 he worked for the United Nations in Vienna and Turin (as Head of Research of UNICRI). In 2008 he received the Sellin-Glueck Award of the American society of Criminology for his lifelong contribution to international criminology. He currently holds the Pieter van Vollenhoven chair in Victimology and Human Security at the University of Tilburg (The Netherlands) and acts as consultant for Eurostat on the design of the European Union Survey on Public Safety to be conducted in 2013. (1) The 2003 US National Crime Victim Survey investigated victimization by credit card fraud as a subcategory of identity theft. 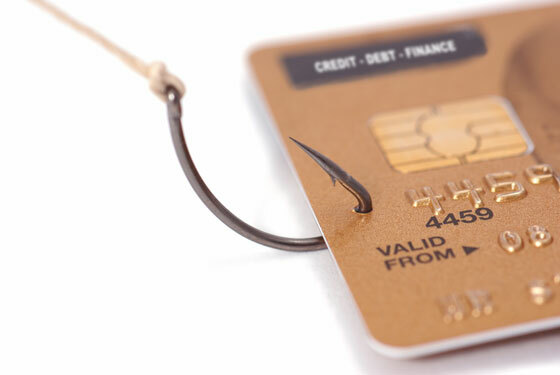 This study showed a one-year prevalence rate of victimization by credit card fraud of 2.4%. The Australian version of the ICVS, which used a somewhat different set of questions on E-fraud, showed that 5% of the national public had been victimized by credit card fraud while doing transactions on the Internet (Johnson and Krone, 2007). The British Crime Survey has included a question on credit card fraud in its questionnaire since 2006. The national prevalence rate has gone up from 3.7% in 2005 to 6.4% in 2009 (Walker et al, 2009).